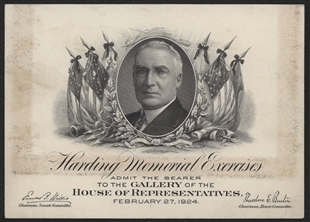 Warren Harding died in August 1923 and lay in state in the Capitol Rotunda that same month. 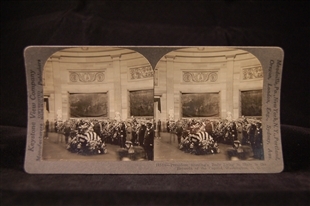 It was not until February of 1924, however, that the House hosted a Joint Meeting of Congress to mourn the dead President. This elaborate gallery pass served both as a ticket to the event, to hear Secretary of State Charles Hughes speak, and as a souvenir of the occasion.